Lean Coffee is a lightweight way for self-organizing a group of people together to share information. Originally started by Jim Benson and Jeremy Lightsmith in 2009 in Seattle, I have found it can be a very simple way to bring together or build a community. I have been running lean coffee Q&A discussions in Orlando since August 2012 and I wanted to share what an amazing tool this can be for your company or professional group. In this blog post, I’ll talk about the benefits, how it works, and some tips for serving lean coffee. Helps people easily share knowledge – It easily connects people who are seeking or wanting to share knowledge on a common topic of interest. Jim and Jeremy actually started lean coffee as an easy way to share information and learning on Lean software practices. Hence the “lean” in lean coffee. However, the format is flexible enough that you could use it to discuss any number of topics. Find expertise and stories to share – What I have found is you don’t need a bunch of experts around the table. What you do need is one knowledgeable person and many that are curious and have done some exploring of the topics. As the group continues to meet, they will share what they find and they will keep sharing. Calm those nervous about change – I’ve had people attend lean coffee discussions just to find out “What is agile/lean?” and ask their tough questions. Better yet, they hear the stories of others around the table of how they struggled and succeeded with some practice or an overall agile/lean adoption. Sharing stories is a powerful motivator. You might start a new community – When I wanted to reboot Agile Orlando, I too wanted a lightweight way to get people together to share knowledge and experience. It was amazing how quickly people took to the format and starting telling friends about it. A few months in, some of them (not me) suggested rebooting Agile Orlando. A little over a year later, we are at 124 members. I later read that a “learning community” is formed when people are “actively engaged” in “learning from each other” by “habituation”. Lean coffee has all of these elements: you have a group of 4-8 that meet every 1-2 weeks to share their latest experiences or what they have read. If you are familiar with an Open Space event, BarCamp, or UnConferences, you have seen how a large group of people can organize around a conference theme and quickly build their own agenda of topics they are passionate to share. But what if you want to get together more often? What if you only have an hour? What if you just want to meet with a small group of people you know (or complete strangers) who are equally interested in your topics? What if the only supplies you have are sticky notes, sharpie pens and a timer (probably on your smart phone)? What if the only time you had to organize was send out a calendar invite? Then you have the right conditions for a lean coffee discussion. Just visit a Lean Coffee (best way) – Look for cities with Lean Coffee discussions on leancoffee.org or on meetup.com (search for “lean coffee”). If you are in Orlando on a Friday, come find our Lean Coffee at AgileOrlando.com. If you go to any of the agile conferences these days, you will usually see lean coffees pop up early in the morning before conference sessions start. Venue is important – You want to pick a location where people are relaxed and feel open to share. Coffee bars are nice in that they are usually quiet, have good beverages, and have tables that 6-8 people can easily gather around. Folks have asked me if they can do this in other locations. Sure! But make sure that it’s not too noisy so people can easily hear each other. You don’t want to shout at lean coffee. Ask others to facilitate – This is a simple format and it’s a great way to practice some basic facilitation techniques. If you have someone that wants to be a better facilitator, spend a little time before and after coaching them. I can share more on that for anyone interested. Have someone experienced present, but don’t have them do all the talking – Lean Coffee is about sharing and building community. It’s not about showing who is the smartest in the room. Be sure to use good facilitation to “balance” who is talking. If you are the facilitator AND the most experienced, let others share first. Let the new folks go first – I’ve seen this a few times in our lean coffees where a new person will join the group and their topic gets voted up in the backlog. That is a great way to welcome in a new person to lean coffee. I may add more tips later, but this is a long enough post. Todd Sheridan and Jean Tabaka for introducing me to this format through Boulder Lean Coffee in 2011. If you are in town, you should stop in and share your knowledge. 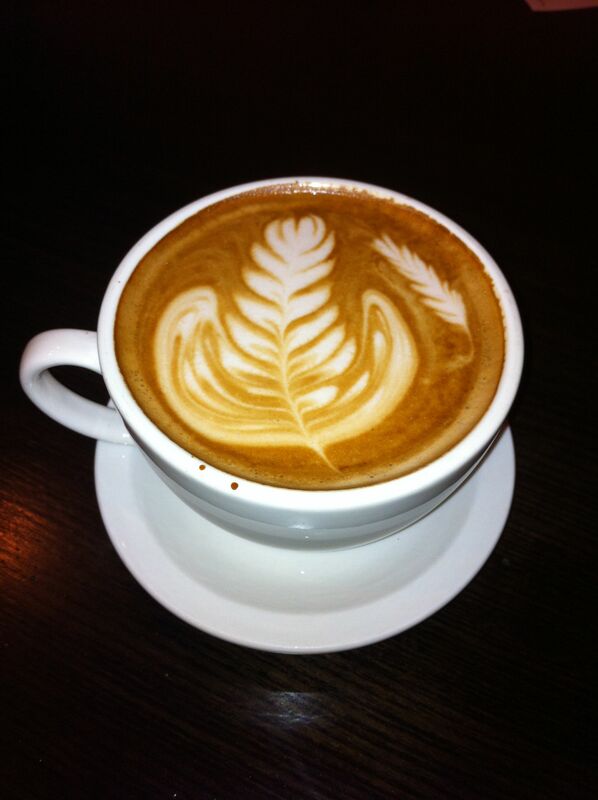 Also, the photo of the latte is from The Cup Expresso Bar where they meet. Great coffee! Gerry Kirk for producing the great handout! Gerry runs an online course for personal kanban using lean coffee format for the live conversations. It’s a great course.